What a difference two months makes. Back in January, with jobs aplenty and Americans spending like drunken sailors (sending their savings rate to the lowest on record), average hourly earnings suddenly spiked, unleashing the February VIXplosion over concerns that the Fed is behind the curve and will be forced to hike much more aggressively. Well, fast forward to today, when all those "green shoots" are either dead or on the verge, and after today's Personal Income and Spending report, it appears that it is stagflation that is once looming. First, core PCE, the Fed’s favorite inflation gauge, rose 1.6%YoY in February 2017; the biggest gain since April 2017. Meanwhile, the PCE deflator rose by 1.8%, coming hotter than expected, just as the cellular service price collapse falls out of the Y/Y data, sending annual inflation higher by 0.3%, and is set spook the next set of CPI data. In other words, inflation is here. Then there is the US consumer's reaction, and while until just a few months back the US savings rate was at all time lows, it has since jumped to 3.4%, the highest since August 2017, as households are no longer spending more than they can afford, a theme we observed at the end of 2017. This also means that spending is lagging income for 3 consecutive months, as something appears to have spooked American consumers. That something may be wages and salaries themselves, because while the BLS' statistical approximation of average hourly wages is just that, the BEA's personal income actually carries wages and salaries data for both private and government workers. 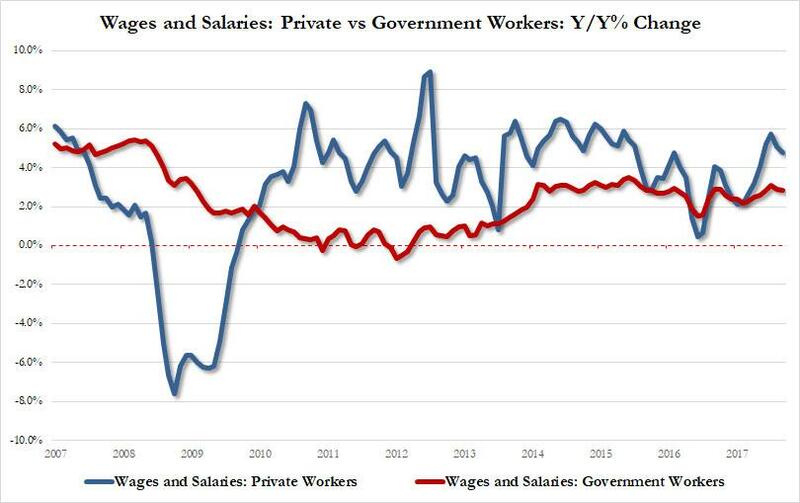 What it found is that after peaking in December, wage growth for these two worker groups has declined for 2 consecutive months, confirming what many have warned, namely that the recent period of benign wage increase is over, and now the slowdown begins. All of the above also leads into what we said yesterday, namely that household buying plans have plunged in recent months. 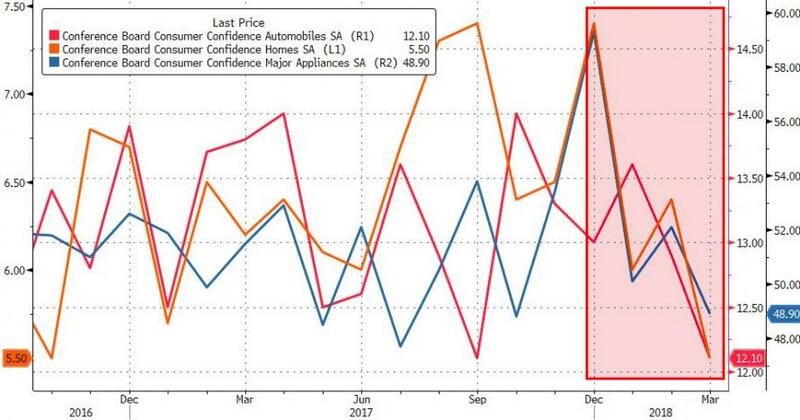 For those who missed it, yesterday we showed that that "Conference Board 'Plans To Buy' Homes, Autos, and Appliance have all plunged in the last three months"
And now we know why: between higher prices, declining wages, rising savings (not to mention maxed out credit cards), and plunging spending plans, Americans have once tapped out.